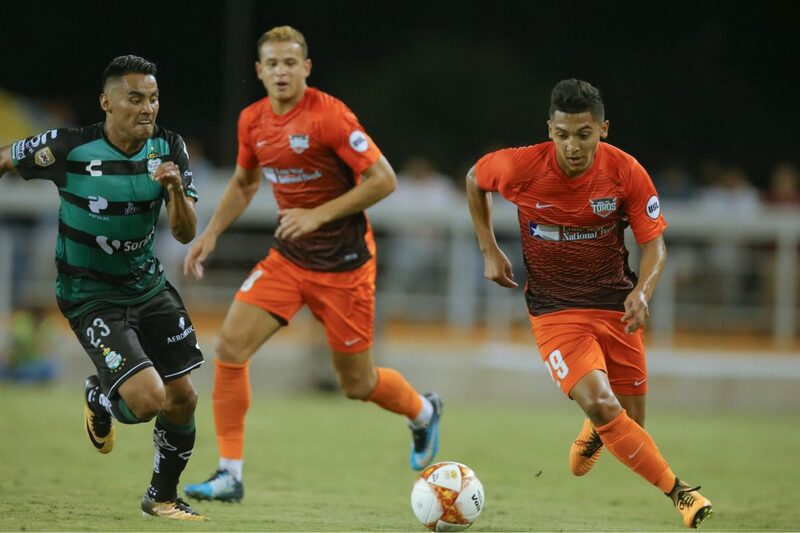 The RGV FC Toros Brandon Morales, right, chases the ball during an exhibition match against Club Santos Laguna on Wednesday at H-E-B Park in Edinburg. EDINBURG — About a month after he started training with the RGV FC Toros, Brandon Morales was pulled aside by coach Gerson Echeverry and asked how he envisioned his future. A 2018 graduate of the RGV FC Toros Academy, Morales was committed to play Division I college soccer at Air Force. He was slated to begin his basic cadet training in June, shutting out the outside world for about six weeks as he prepared to balance the demands of soccer and military life. After graduation from Air Force, Morales would be required to complete five years of military service. Morales wasn’t ready to give up on his goals, so he chose to forego his cadet training in favor of more training with RGV FC. His decision showed the first signs of paying off on Friday, as the Toros announced that Morales had become the first player in academy history to sign with RGV FC. Morales, an 18-year-old native of Pharr, is eligible to play this season. Before spending the past two years with the Toros Academy, Morales said he faced his biggest challenge in 2015, when he was with the Houston Dynamo academy. His father, Javier Morales, said the family previously considered a number of options when Brandon outgrew the area competition during his preteen years. Javier said Brandon has always been an excellent student — part of the reason the family wanted him to continue his development in the United States. Joining an academy in Mexico was an option, but Brandon’s mother especially was against the idea of him being away on his own, Javier said. After taking Brandon to play in competitions around the state, Javier received an unexpected call from the Houston Dynamo wanting Brandon to potentially join their academy. Following a successful tryout, the wheels were quickly put in motion. “Everything went from one to 60 in a matter of weeks,” Javier said. Javier and Brandon moved to Houston, while Brandon’s mother and two brothers remained in the Valley. Javier said the arrangement put a financial strain on the family, not just for having to find a new living arrangement, but also because of the travel. He recalled once visiting the Valley to see the rest of the family for just a day before driving to Dallas for a game and then back to Houston the following day. For Brandon, the greatest hardship was being away from his family for the first time. But he also said he never truly felt comfortable with the Dynamo Academy and its training staff. After his first season, he decided during a family meeting that coming back to the Valley was the correct move. Javier said he’s worked as a graphic designer with the RGV Vipers and later the Toros since 2009. When the organization decided to branch out into a youth soccer academy, he used his experience helping his sons through the youth soccer system to assist with the logistics of training sessions and tournaments. Brandon jumped at the opportunity to train in an academy system close to home, becoming a team captain and the first to sign to the RGV FC organization. Morales said his immediate goal is to earn minutes with the Toros. After that, he said he would love to have the opportunity to sign a Generation Adidas contract to enter the MLS. If not, he and Javier both said they would like to see Brandon play in college starting in fall 2019. He has interest from Georgetown and the University of Michigan, they said, and his offer from Air Force still holds for next season. A midfielder, Brandon said he prides himself on his speed, agility and attacking ability. He also said he believes he reads the game well and sees plays developing before they happen. He admits that the pace and physicality of training with the Toros first team were initially difficult to adjust to, but Echeverry said Brandon has shown stamina, technical ability and the skill to play both ways at any midfield position. Echeverry said Brandon could see the field for RGV FC this season, but he did not specify when that opportunity might come. The Toros’ next game is against the Las Vegas Lights at 7:30 p.m. tonight at H-E-B Park.